The videos were a big hit in the ISB courses. Since moving to Taiwan, I've created and offered a similar flipped BADM course at National Tsing Hua University, and the videos are also part of the Statistics.com Predictive Analytics series. I’ve since added a few more topics (e.g., neural nets and discriminant analysis). The audience for the videos (and my courses and textbooks) is non-technical folks who need to understand the logic and uses of data mining, at the managerial level. The videos are therefore about problem solving, and hence the "Business Analytics" in the title. They are different from the many excellent machine learning videos and MOOCs in focus and in technical level -- a basic statistics course that covers linear regression and some business experience should be sufficient for understanding the videos. 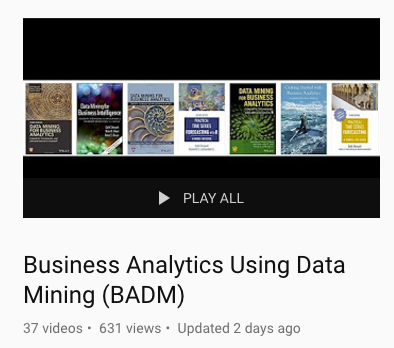 This new playlist complements a similar set of videos, on "Business Analytics Using Forecasting" (for time series), that I created at NTHU and made public last year, as part of a MOOC offered on FutureLearn with the next round opening in October. Finally, I’ll share that I shot these videos while I was living in Bhutan. They are all homemade -- I tried to filter out barking noises and to time the recording when ceremonies were not held close to our home. If you’re interested in how I made the materials and what lessons I learned for flipping my first course, check out my 2012 post.